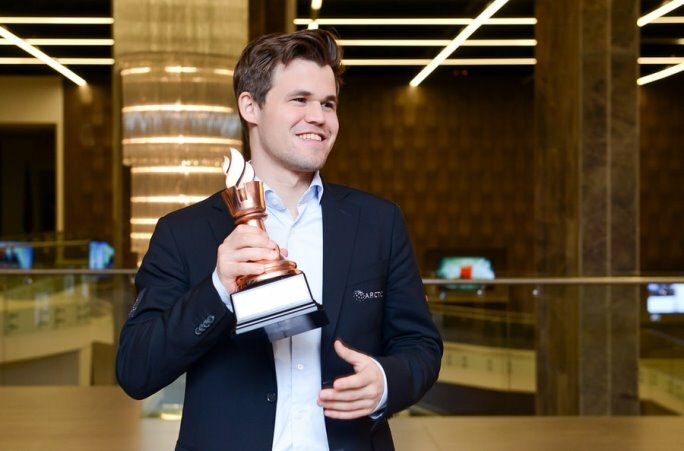 It wasn’t the stuff of legend, but a 20-minute draw against Ding Liren was all Magnus Carlsen needed to wrap up his third Shamkir Chess title on Saturday. The draw also guaranteed the Chinese no. 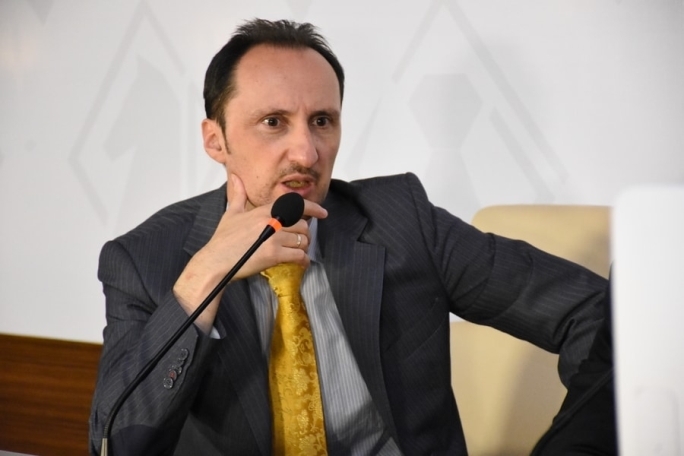 1 second place, while third was snatched by Sergey Karjakin, who woke from the slumber of eight draws to inflict a third loss in a row on Veselin Topalov. The Bulgarian had done more than anyone else to breathe life into the tournament. His reward? An 8th place finish. I’ll dare to make a prediction. Carlsen will beat Ding. 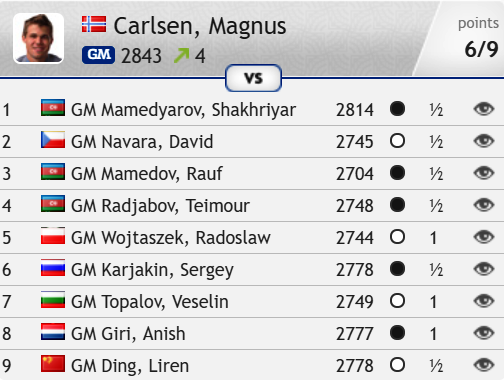 The game is a matter of principle – no doubt Magnus doesn’t like the fact that the Chinese player has already gone 68 games without a loss. The Champion won’t shut things down, ensuring first place, but will go for a fight. Karjakin will take advantage of that to beat the crumbling Topalov and catch Ding. Navara has been abject at the finish, losing four in a row, but I wouldn’t go as far as to predict that that tendency will be stronger than the unshakeable peacefulness of Radjabov. It could end up being amusing, though – “Carlsen is still the best, Karjakin and Radjabov shared second place, having smoothly navigated the long haul, avoiding defeat”. It really won’t have been for nothing that they put together so many draws and saved their energy for the final sprint. Yup, the beautiful is never in vain. I don’t think there is any game of mine from this tournament that will enter into any best game collection, but I thought the game yesterday against Giri was a nice fight. There were mistakes, but it was difficult. That’s the only game I’m more or less satisfied with… There were a lot of uneventful draws. Normally I would be worried about that, but at some point I stopped caring so much. For me a crucial point was clearly in the 7th game against Topalov – until then he’d been leading the tournament. If you look at the final standings, we’re far apart, but it was by no means obvious that I was going to win that game… The fact that I’ve won here three times in a row I’m very proud of, but it’s always a bit coincidental. You cannot always control your destiny in these tournaments. I have many interesting tournaments coming up. Ding and I are both playing in Norway (Altibox Norway Chess starts on 27th May), which will be very strong, and there’s plenty to come. It’s in the back of my mind, for sure, but that’s the way it will stay for the moment – in the back of my mind, not the front. 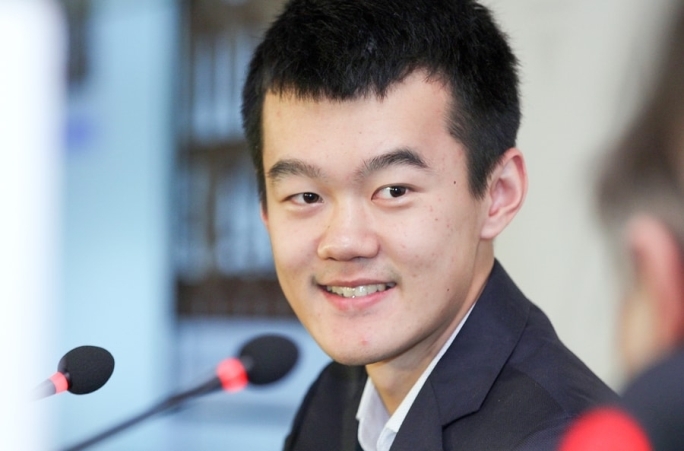 For Ding Liren the tournament in Shamkir marked a new milestone on his climb to the very top. He’s now entered the live top 5 with a rating of 2791.1, and if his unbeaten streak continues much longer 2800 will be the next barrier to fall. 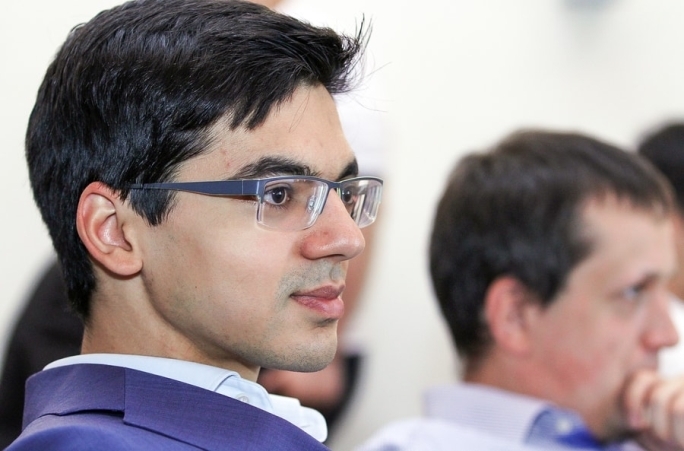 He sealed 2nd place with consecutive wins over David Navara and Rauf Mamedov, though he felt his best game was the draw against Anish Giri where ultimately he let his winning chances slip. Shakhriyar Mamedyarov went one step further than Ding Liren and considered his best game to have been the only one he lost, to Veselin Topalov (“I play very well, like an engine”). He got back to 50% by beating David Navara, and said that made it, “just a bad tournament, not a very bad tournament”. In the final round he played Rauf Mamedov, who’d struggled to sleep after his blunder and loss to Ding Liren the day before. Mamedov-Mamedyarov wasn’t quite as fast a draw as Carlsen-Ding Liren, but the outcome was never in doubt. 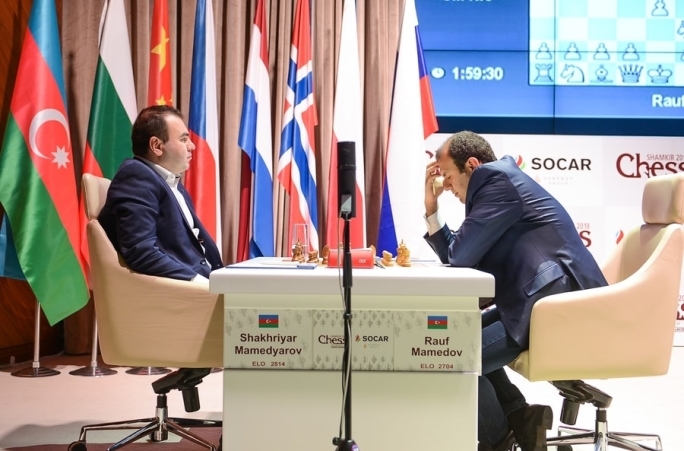 In fact in the five editions of Shamkir Chess the only win for an Azerbaijan player against a fellow countryman was when Mamedyarov beat Eltaj Safarli in 2016. As we can see, this year there were a lot of draws: both fighting, and not so much. Let’s say in some games it was obvious there would be a draw. A lot of “relaxed” games were played, where you couldn’t particularly sense any internal struggle. That must disappoint the organisers? Of course it’s disappointing. We’re not putting on the tournament to be accused of organising everything for friends, so let's say they can come here for a rest, make draws and then go their separate ways. After all, a tournament in memory of Vugar Gashimov implies a struggle! Yes, especially as he had a bold style! Vugar was an uncompromising chess player, and therefore I think a tournament in his memory should be bold and full of action. I don’t see that here, but I know where there’s a struggle and where there isn’t. Almost all those involved have begun to understand that. Of course it’s disappointing. 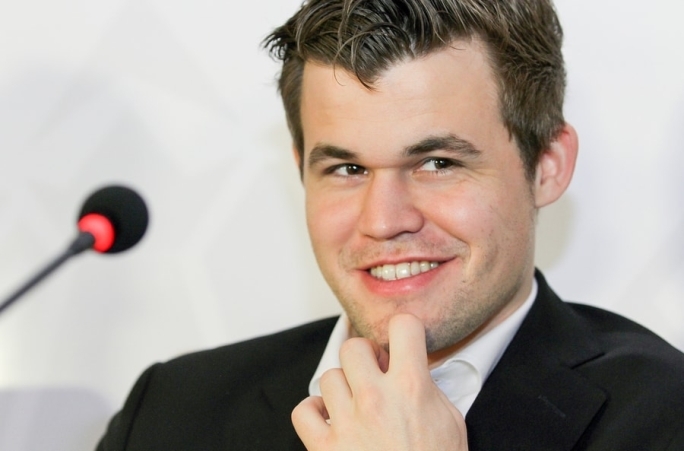 But Magnus Carlsen didn’t disappoint? 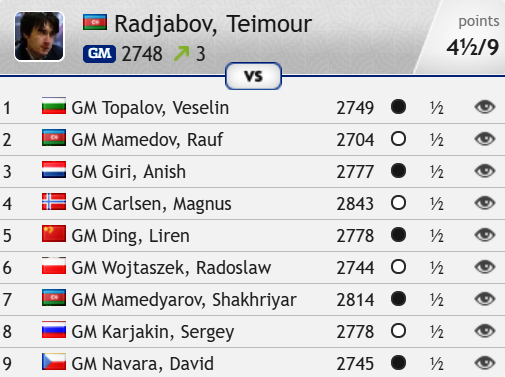 The star performer when it came to draws was Teimour Radjabov, who completed a perfect 9/9 against David Navara, who had lost his last four games in a row. 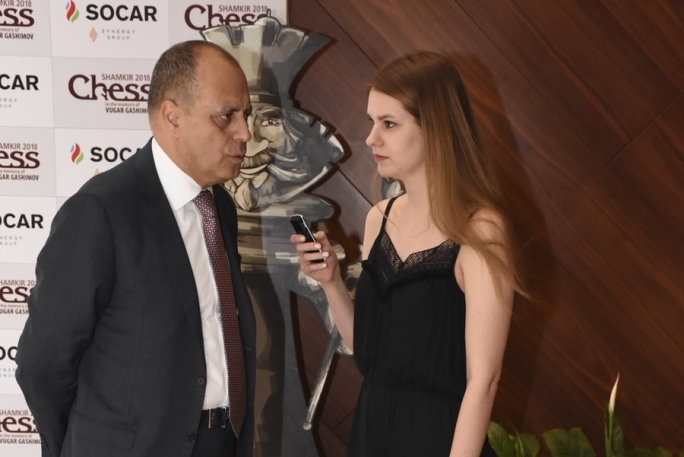 That meant Teimour had failed to win a game in the last three editions of Shamkir Chess he’d played, but he was satisfied with the performance since, “for a long time I didn’t even touch the pieces at the highest levels”. In good form I can compete with them, but in bad form it’s very hard for me, because they’re stronger. 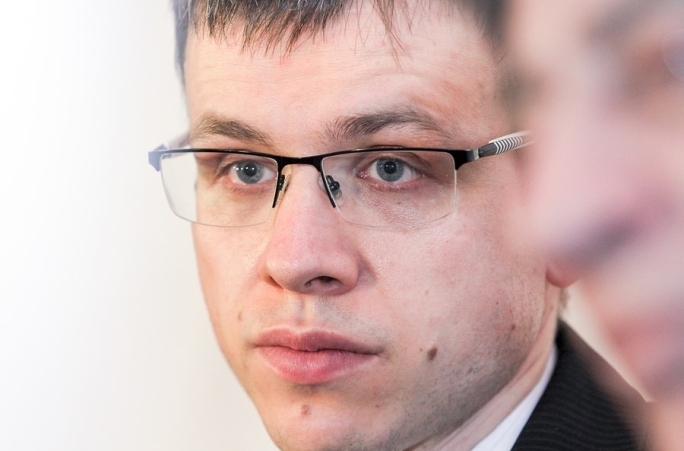 Wojtaszek-Giri was a theory-heavy draw between like-minded individuals. They both won one, lost one and made seven draws, and both felt they’d scored better than they played in Shamkir. The remaining game, Karjakin-Topalov, was where Emil’s prediction at the start came true. After eight draws, most of which seemed to be followed by Sergey giving a variation on, “I played a line that’s a draw, but only if he knows this complicated theory”, the Russian star finally scored a win. It was surprisingly difficult to win, but Sergey got there in the end. So that’s all for Shamkir Chess, but there’s not going to be any break in top-level action.We have Sunday's final round of the US Championships (Open | Women), the final three rounds of the Chess Bundesliga from Sunday to Tuesday, and the Russian Team Championship starting on Tuesday, to name but a few. 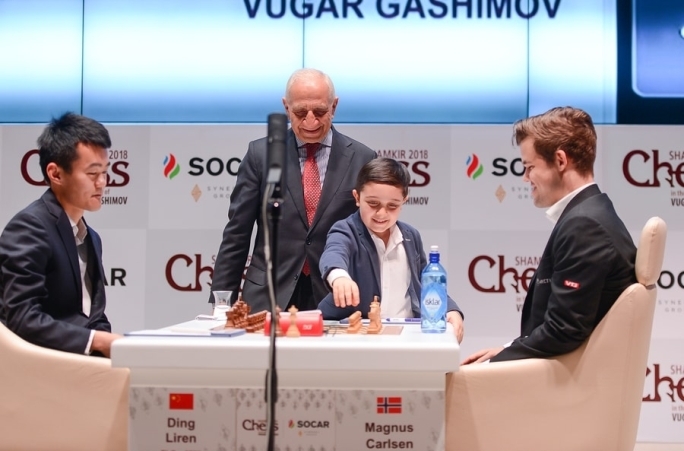 Shamkir Chess 2-3: Why all the draws?